Item # 314662 Stash Points: 395 (?) This is the number of points you get in The Zumiez Stash for purchasing this item. Stash points are redeemable for exclusive rewards only available to Zumiez Stash members. To redeem your points check out the rewards catalog on thestash.zumiez.com. Stick the I Need Money Not Feelings Sticker from Married To The Mob anywhere, and maybe somebody will give you more money. This sticker features a stack of cash and text that reads "I need money not feelings." 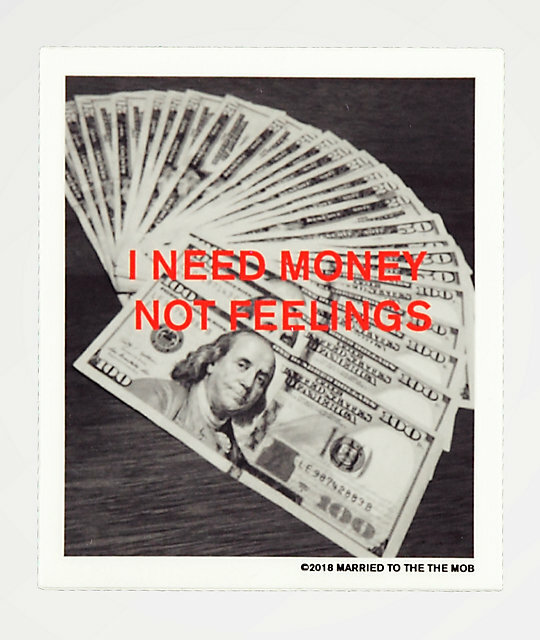 I Need Money Not Feelings Sticker from Married To The Mob. Image of a stack of cash with text that reads "I need money not feelings". 4" x 3.5" &vert; 10cm x 8cm (approx. ).